Yvelines – 40 kms away from Paris. Property of 800 sq.m. 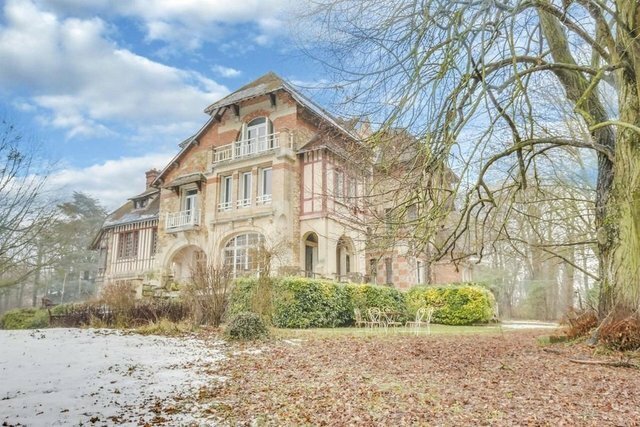 dating from 1910 anglo-norman style, with a caretaker’s house, set in a park of 7 hectares. Entirely renovated sumptuous historic dwelling. Large cathedral living-room of 100 sq.m. with monumental stone fireplace, passageway and 7-metre ceilings. It also comprises an entrance hall with wood stove, a csy living room with fireplace, a bright dning room, a kitchen, 11 bedrooms and a basement throughout. Landscaped park, overlooking the valley, a paddock and a natural truffle grounds. Ideal location. Close from Golf du Prieuré, de la de la Chouette et de Seraincourt and 11 kms from te station (direct line to Saint-Lazare) and the future RER ( « Grand Paris » Eole project). Paris Ouest Sotheby's International Realty. Votre contact : Sophie Cardon au 06.60.77.78.56.